Sakura, or the event of viewing cherry blossoms, is a symbol of Japan and been loved by Japanese people for hundred's of years. Sakura begins blooming around the end of March in Tokyo, and Japan. This seasonal event tells us that spring has arrived. In Japan, there's a traditional custom called Hanamki, also called Ohanami, which is flower viewing in the most literal sense, but more importantly simply means enjoying cherry blossoms. The origin of Hanami goes back to 9th century Kyoto, where nobles started the trend of celebrating the reading poems while looking at cherry blossoms. In the Edo period (16th to 18th Century), Hanami turned into a seasonal event for everyone to go to view the cherry blossoms, generally to enjoy oneself by drinking and eating under the cherry trees. Hanami is still popular to this day and there remain many famous Sakura spots in Tokyo, as well as all over Japan. You might see people in business suits having Hanami under cherry trees after work in central Tokyo. If you come to Japan in the Spring, this is a very good opportunity to enjoy Sakura. Weathernews.inc. forecasts when the cherry blossoms start blooming every year. They forecast in accordance with the climate and the condition based on a cherry flower called Someiyoshino, the most famous kind and synonymous with all cherry blossoms in Japan. Where to view Sakura in Tokyo? Since Sakura is so popular that you can find them often in the towns of Tokyo, on streets, at temples, shrines, gardens etc. There are many spots for enjoying Hanami too. The list below is of Sakura spots where you can reach by a 10 minute, or so, walk from a transit station. As accessibility is good, why not drop by when you go sightseeing, or shopping, in Tokyo. A famous Sakura spot in Tokyo, having over 400 years of history and often pictured by Ukiyoe printing. 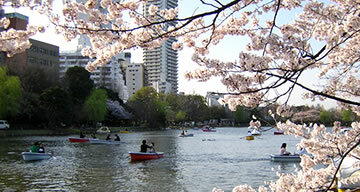 It has more than 1100 cherry trees around Ueno Park and Shinobazu Pond. Only 3 min walk from Ueno Park Exit of JR Ueno Station. Imperial Palace is one of the most popular Sakura spots in Tokyo. 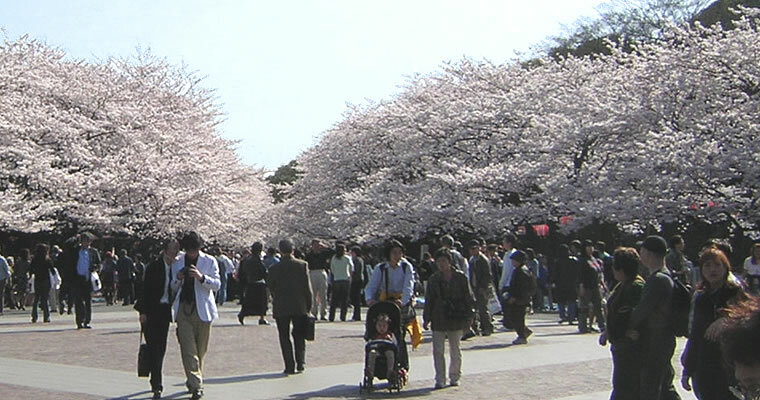 Especially, the Chidorigafuchi is famous Hanami spots and gets crowded with many visitors coming from all over Japan. A park along by the Sotobori moat between JR Iidabashi and Ichigaya Station. It's known for the lane with a row of 700 Cherry blossoms. A large park with lawn having more than 800 cherry trees. Yoyogi park is next to Meiji-jingu Shrine and is close to Harajuku and Omotesando shopping area. Kamakura is known as a small Kyoto near Tokyo and has many old temples. Tsurugaoka Hachimangu Shrine is the symbol of Kamakura. From JR Kamakura Station to this Shrine, there is a lovely lane with cherry trees. It's been said that people who had Hanami at this cemetery first were students of Art university nearby. It is now a popular Hanami spots loved by local Yanaka people. It's only 1 or 2 min walk from JR Nippori Station. It is a bit off of the central Tokyo, but Asukayama is one of the most famous Hanami Spots that has been loved by local people since 280 years ago. A park with 1000 cherry trees with10 different varieties. This park was developed about 10 years ago along the Arakawa river. A large park located 1 station away from Tokyo Disney Land. This park has attractions like an aquarium and a Ferris wheel as well as 600 cherry trees of 6 different varieties. It has more than 800 cherry trees along the Meguro stream between Meguro and Nakameguro (next to Ebisu.). There are stylish cafes along the river where you can enjoy coffee and Hanami.